David Greenberg and Raymond Loo were talking about selecting potatoes for disease resistance, when this very interesting note about potato viruses came up. I thought it was important to share. It reminded me of our discussion with Ted Hutten about growing seedlings in mushroom compost and how that reduces fungal disease. Raymond: There’s very few viruses in the true seed. You can get spindle tuber and there’s two or three viruses that could be in the seed but there’s very, very few. You should always be starting with clean stuff. One thing I wanted to mention is, you were asking about how long they stay virus free. When we took on/out Sunshine [Island Sunshine variety], and we put it through the ‘virus-freeing’ process, they get sick a lot worse than our old Sunshine that we had for a long time [kept year after year on the farm]. So, I phoned my sister Judy. She’s in Rome right now working with biodiversity, she’s got her Doctorate in genetics so she went and studied down in Oklahoma State back when they were just starting to genetically modify stuff. So, we had great discussions and so I phoned her one day because it just kind of hit me that the potatoes that we have growing outside, we get rid of their immune systems when we ‘virus-free’ them. I think the viruses are naturally in the potatoes and they keep the other stuff out to a certain extent. What’s happening is the potatoes have reached equilibrium so there’s only so much room, we’ll say to put it very plainly but there’s only so much room on top of here for everything to be there right so if you get rid of…if you have a residual population of viruses we’ll say, or bacteria or fungi that eats viruses, it’s kinda like the idea of Elaine Ingham from Soil Foodweb…so the idea is that there are viruses in the potatoes that are acting like their immune system. DISCUSSION WANTED: I have observed the same thing. When I keep potatoes year after year, I find they do really well. I’ve never compared and measured virus levels, but it would be interesting to do. 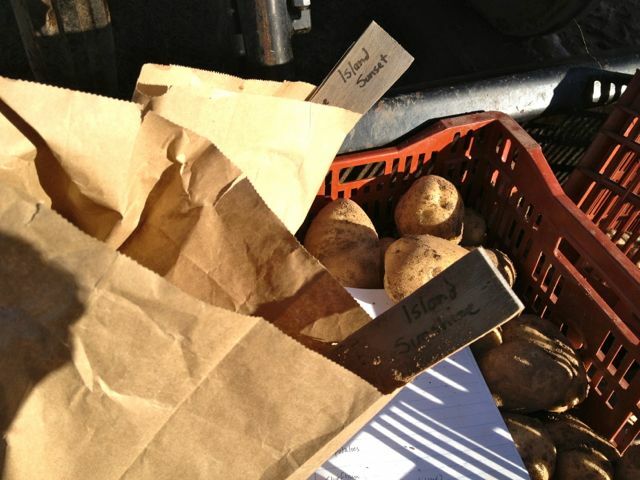 We are continuing with seed potatoes from Raymond Loo and seed from Raoul Robinson. We will continue to select the best ones, and keep the seed year after year. Feel free to comment and share what you are doing with your potatoes. Does anyone have potatoes that seem to be able to resist potato viruses? Do you keep potatoes for planting the following year? Do you have a special variety you like? 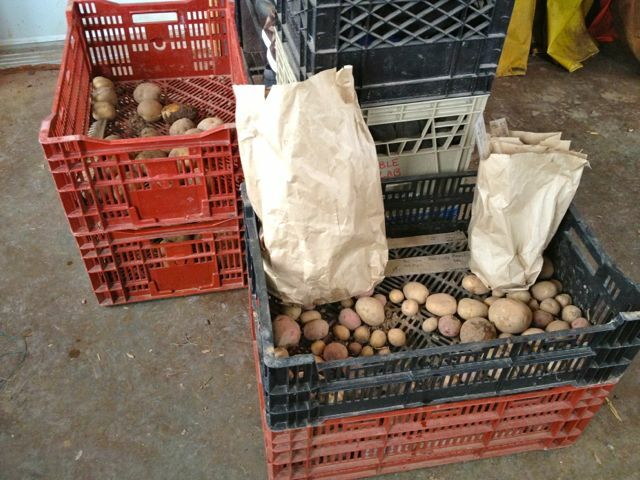 This entry was posted in farm mentors, potatoes, seed saving and tagged Island Sunset, Island Sunshine, potato selection, potato virus. Bookmark the permalink.